With autumn approaching, English apples will be in season and being in Bristol we are spoilt for choice when it comes to good quality, dry cider. 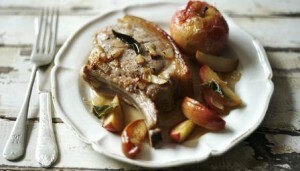 This recipe is easy to do and pork chops are an economic choice when it comes to meat. Season the chops well with freshly ground black pepper and a little salt. In a large shallow ovenproof pan, heat the olive oil and gently fry each chop for about a minute to seal. Add the onion to the same pan with the pork juices, and brown a little before adding in the apple wedges and sage leaves. Add the chops back into the pan amongst the apples and onions along with the 3 whole apples. Pour over the cider, season to taste and cook in the over for about 1/2 hour or until the pork and apples are cooked through.